Apple’s iPhones are some of the most preferred mobile devices when it comes to businesses. Its simplistic yet premium design and powerful innards can get a lot of work done, including keeping track of time and managing teams. Need help getting tasks done before deadline hits? Take a look at your choices for the best time tracking app for iPhone that improves productivity and efficiency via optimized workflows. TimeCamp users will be able to create new tasks, log their hours and toggle the timer on and off with just a push of a button. The app allows for the creation of reports and synchronizes with other TimeCamp apps on different devices, giving you a full view of work done during the day. The TimeCamp time tracking app for iphone also has timesheet approval and reporting tools for managers. Hubstaff gives managers a dashboard view of all team members and pertinent data such as hours worked, projects worked on and average activity levels. The versatile iphone time tracking app has a built-in GPS that keeps track of users and their whereabouts. It even has a feature where the salary is computed automatically according to hours worked. 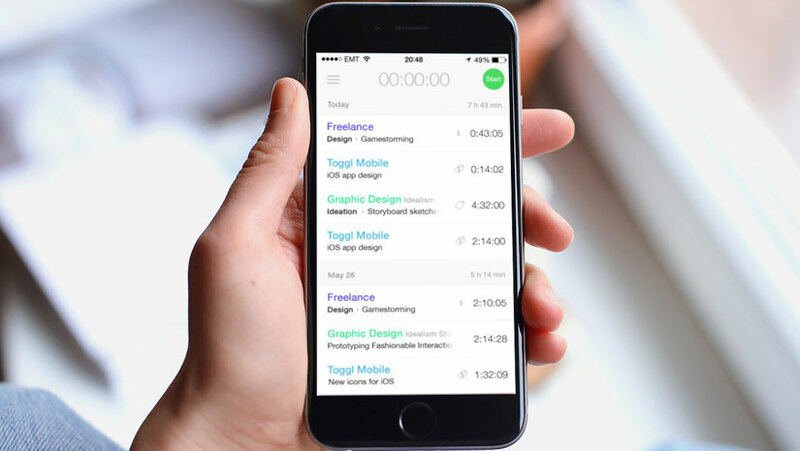 Toggl is one of the easiest time tracking apps you can use. Log the task, toggle the mobile time clock and start working! You can generate additional reports on the allocated time. Data is synced through the Toggl cloud for increased productivity on the go. Managers will be able to see overdue projects, current logged time, initial estimations and if set budgets are met or exceeded using the iphone time tracker app. Boomr is the forefront when it comes to finding a powerful mobile time tracking app for iPhone. The software replaces traditional timesheets with an attendance and billable hour system that’s set in the cloud. Boomr is the go-to iPhone app if your business has multiple office locations or remote workers. The best time tracking app for iPhone users features a GPS-based clock-in, employee alerts, real time monitoring and timesheet to payroll reports that can be integrated into most existing payroll softwares.